Oh the looks I received. Oh the comments. Probably the most common was that A. wasn’t going to sleep once she started crawling. Or that she was going to fall off. Like many parts of our Montessori training, I had no idea what reality would look like with my daughter but thought I’d give it a try. 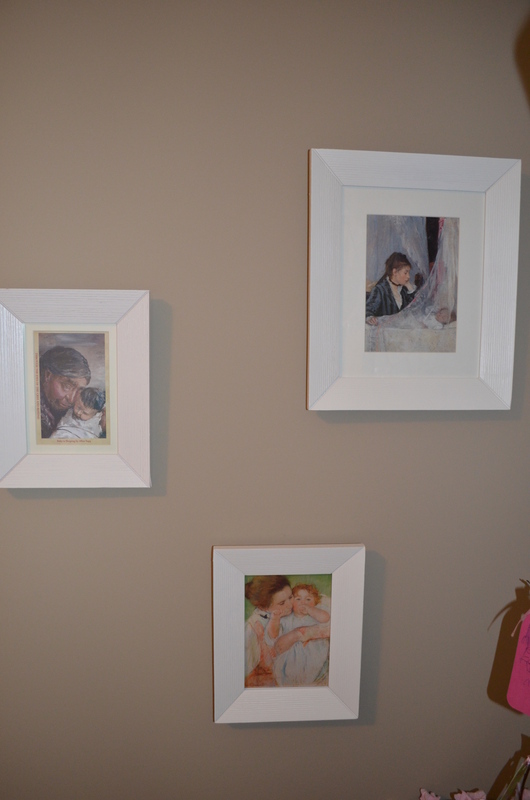 For the first few months I had a cestina loaned to me by Montessori Mom Yvonne who had made it for her daughters. 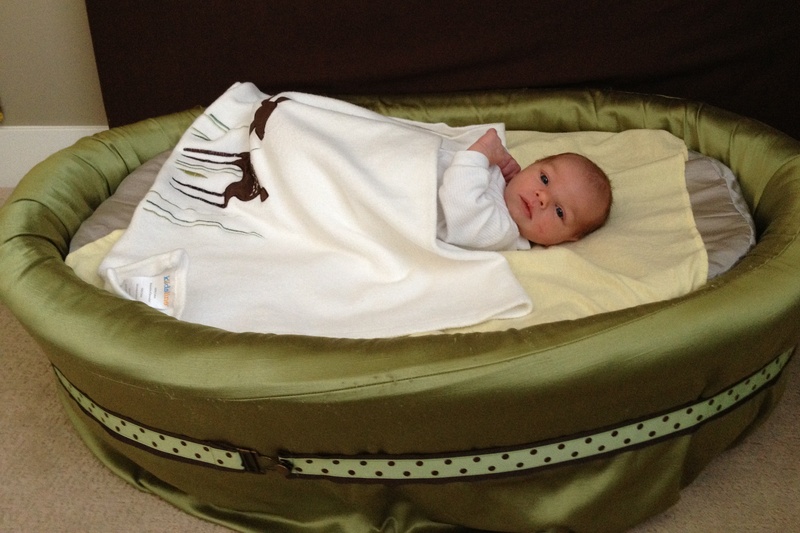 I also had a Moses basket that I used with a topponcino. While A. slept peacefully during the day in her Moses basket, night time was a completely different story. She slept in our arms while we slept in the nursing chair. 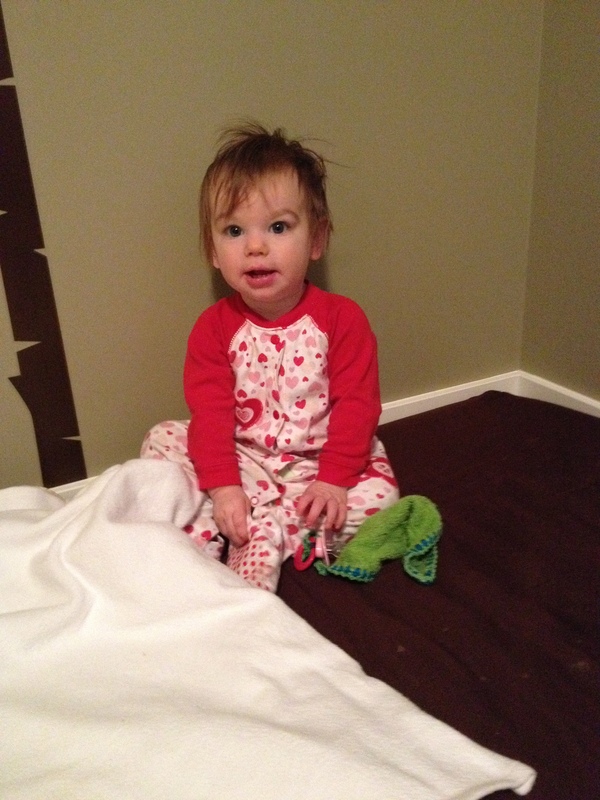 She never did sleep in the cestina but greatly enjoyed playing in it and just observing her world during the day. 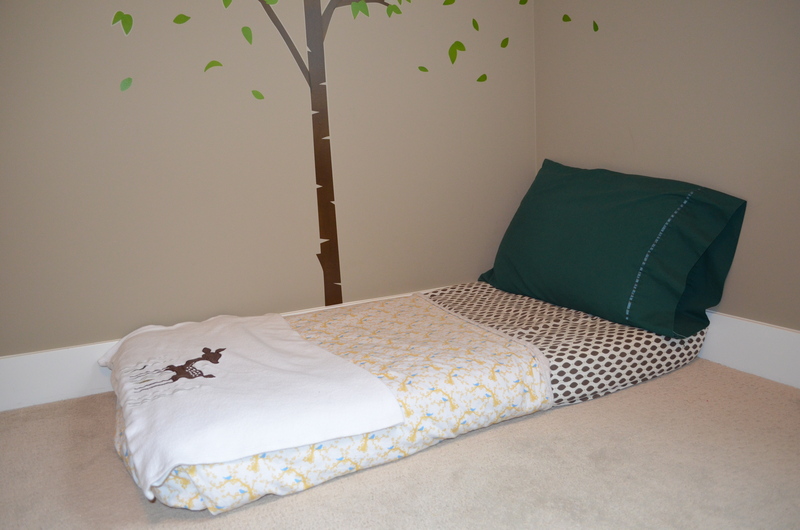 One night my body had enough of sleeping on the chair so I set up a fold-out mattress beside A.’s crib-sized mattress. It was firm and happened to be exactly the same height. A. then either slept on me or beside me, laying on her side. Mostly cuddled in the crook of my arm. It was a slow transition from beside me, to on her own bed. Her startle reflex was still quite strong and she woke up if she was on her back but kept sleeping if she was sleeping on her side and “startled” into me. Around 3.5 Months we made a few changes as she was crying for 2-3 hours every night before falling asleep. It was exhausting for both of us. 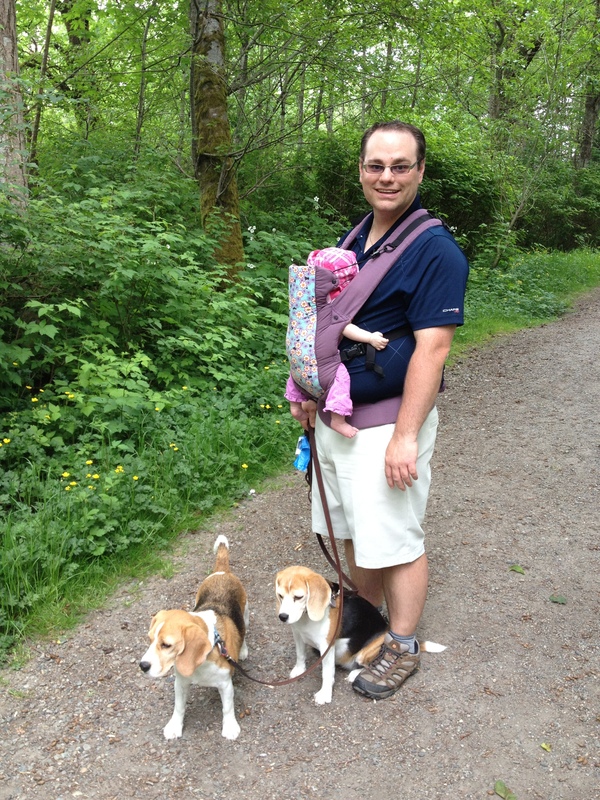 We introduced the soother, started a solid half-hour bedtime routine, made a firm bedtime, and introduced probiotics. I think everything helped her but I believe the most dramatic change was introducing her to probiotics. Within 3 nights of introducing them, it was like I had a different baby. She didn’t cry every single time she fell asleep for naps and she didn’t cry for hours at bedtime. She either didn’t cry at all or the crying was very minimal. 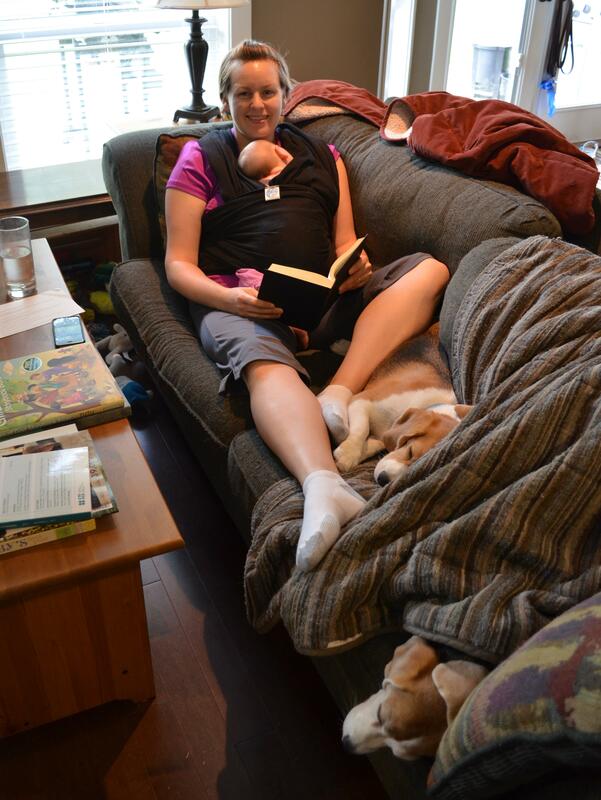 During the day for naps she mostly slept in a baby carrier (ring sling, Moby wrap, or Beco carrier). Peacefully sleeping. She was rolling over by this time so I felt comfortable putting her on her stomach to sleep. Up until this time I had been sleeping with her all night long. Around 4 months she started falling asleep peacefully and I changed to just laying with her until she fell asleep. 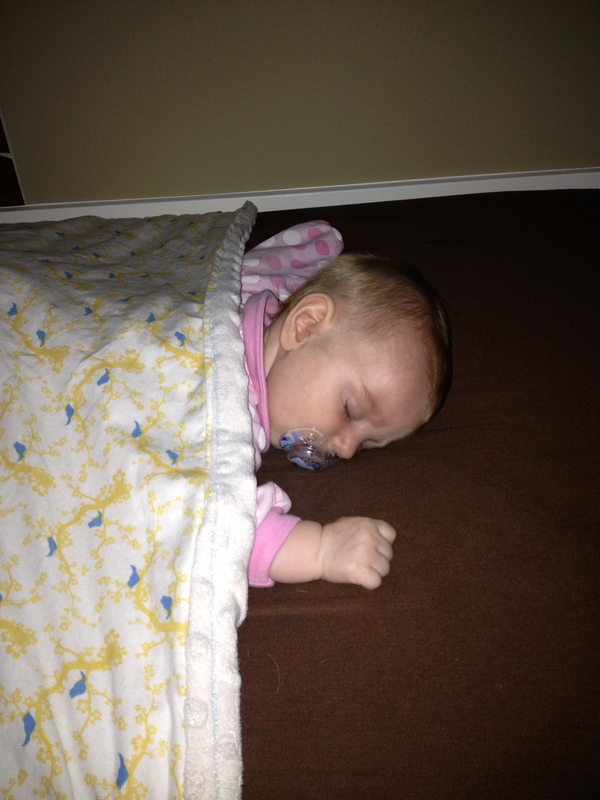 As she was already in her own bed, I didn’t have to do the “put the baby down” dance. Eventually I just took away the mattress that I slept on. 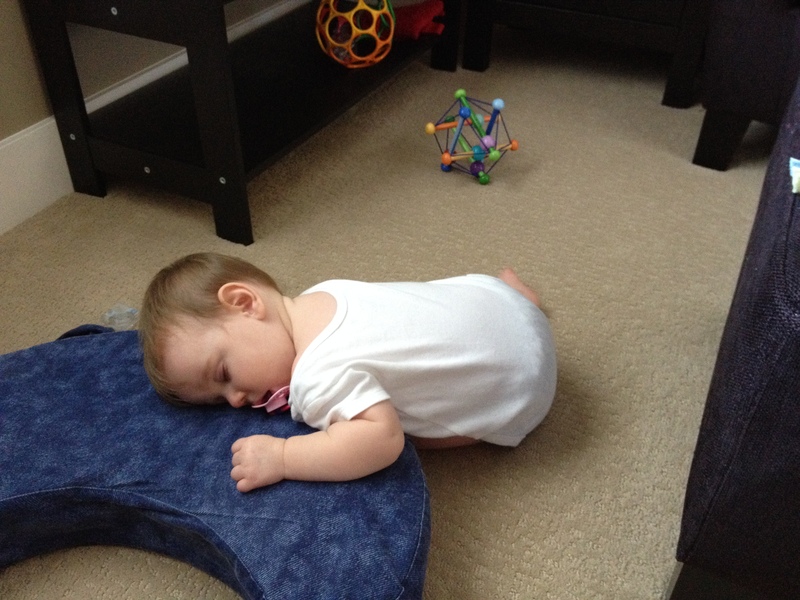 I would lay on the floor until she fell asleep. For a long time she struggled with “the 45 minute intruder” so my husband or I would go lay with her until she fell asleep again. During the night she would wake once or twice for a feed and then go back to sleep. If she was crying in the middle of the night (not for hunger) we would lay on the floor next to her until she fell asleep again. 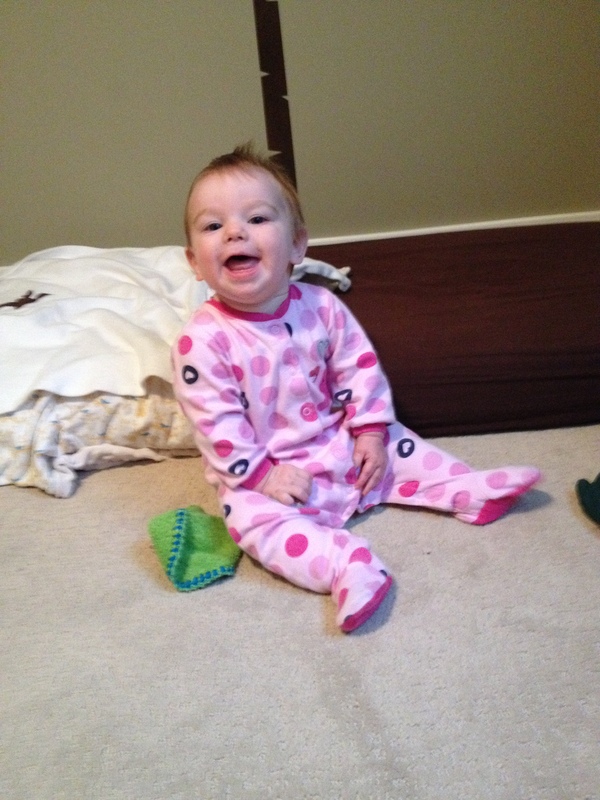 Within a month she learned to “slither” off her bed in the morning and was able to roll to get to her toys. She never rolled off her bed either at night time or during daytime naps. Around 6 months she started army crawling. 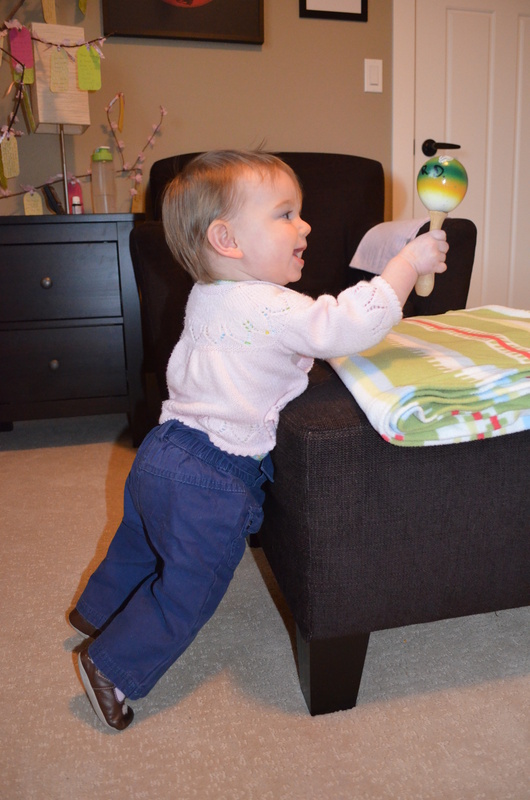 Mornings would start with her army crawling off her bed to her toy shelf and she would begin playing her maraca and opening the drawer. She would do so after naps too. What about daytime naps with the crawler? Did she actually sleep?? She would army crawl around her room and fall asleep on the floor when she got tired. Sometimes she would use the firm nursing pillow as a pillow. Often I would check the video monitor and when she fell asleep I would transfer her to her bed as I found she took longer naps on her bed and I also thought it would help her learn that her bed was for sleeping, not the random spot on the floor. It took a couple of months but she eventually started crawling back onto her bed for naps. There was a transition of sometimes using the bed as her pillow while sleeping on the floor. At evening bedtime she would always stay on her bed. 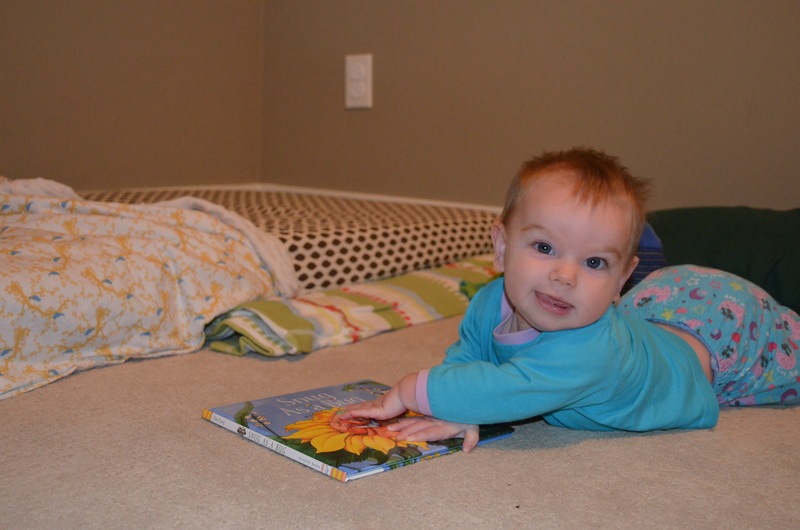 Soon after she began crawling on all fours (8.5 months) she stopped crawling around her room. She preferred to sit on her bed after her nap or in the morning. 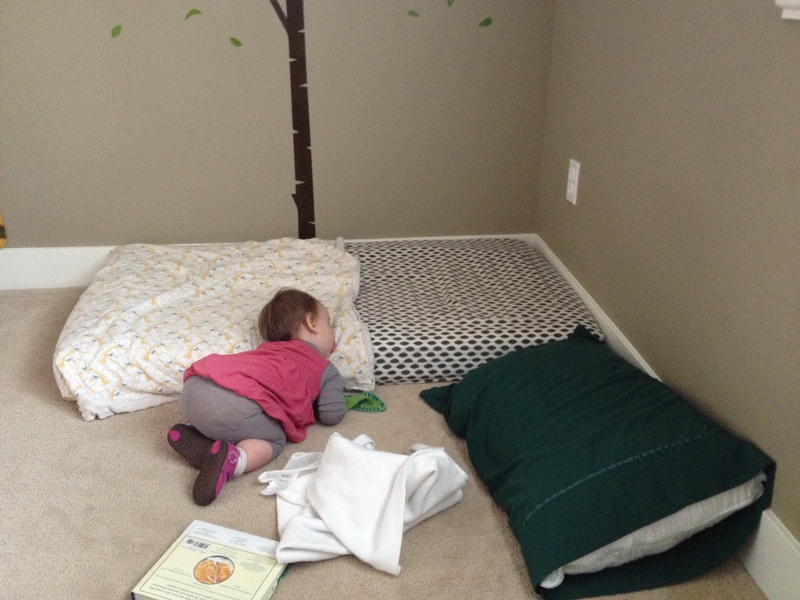 She would play with her blanket, her soother, or her one book beside her bed. She would do so happily for at least half an hour (I usually went to get her by then). It has only been quite recently, around when she turned 12 months and has begun the process of dropping her second nap, that she has started crawling around her room again. Instead of sleeping she happily plays in her room. She has started to play with her toys when she wakes up in the mornings again too. 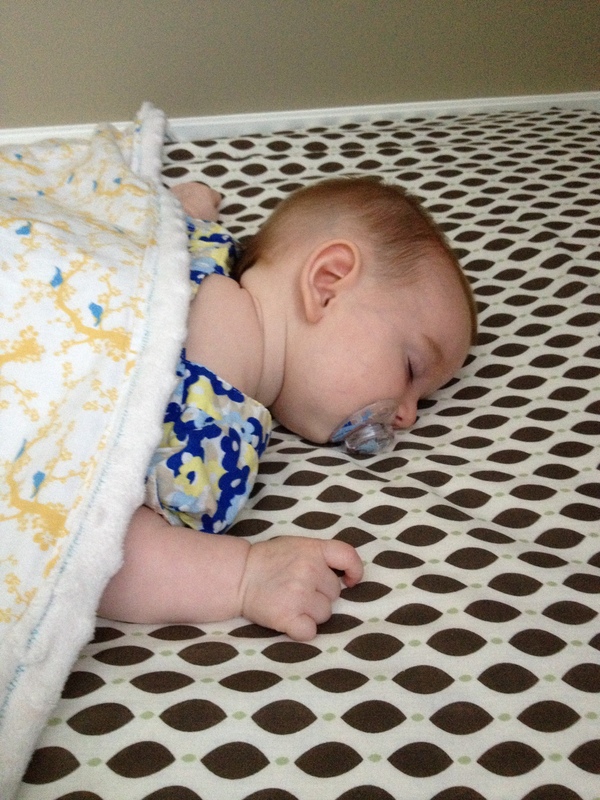 Sleep hasn’t been an easy part of my motherhood journey. Those first few months were very difficult. 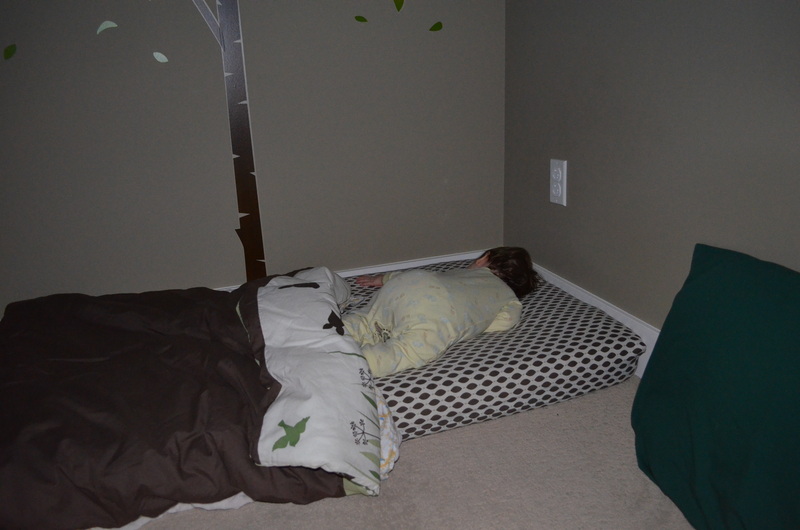 I feel the floor bed really helped to make a gentle transition for A. sleeping with me to sleeping independently. Since she was a month old, she has slept on her own bed at night, so strongly associates sleep with her bed. Throughout her first year it hasn’t always been independently. 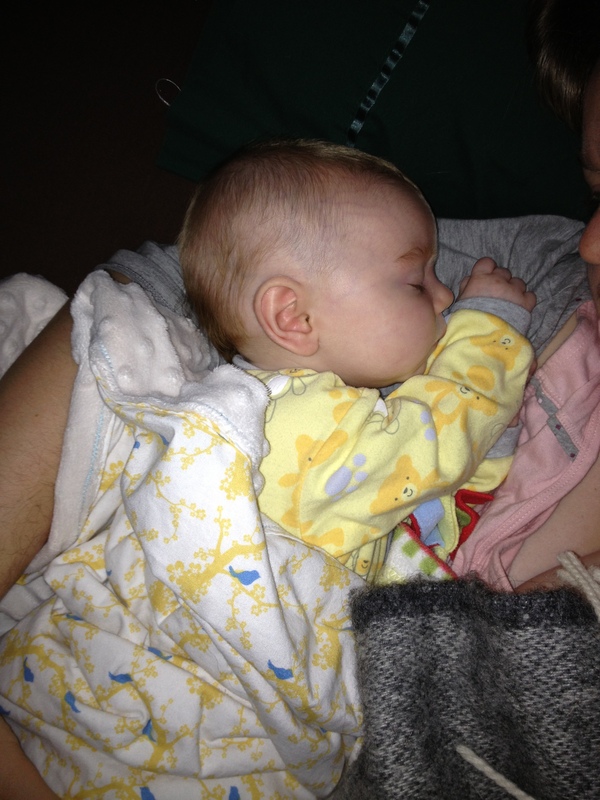 We have snuggled her all night long, as she fell asleep, and in the middle of the night when she needed. 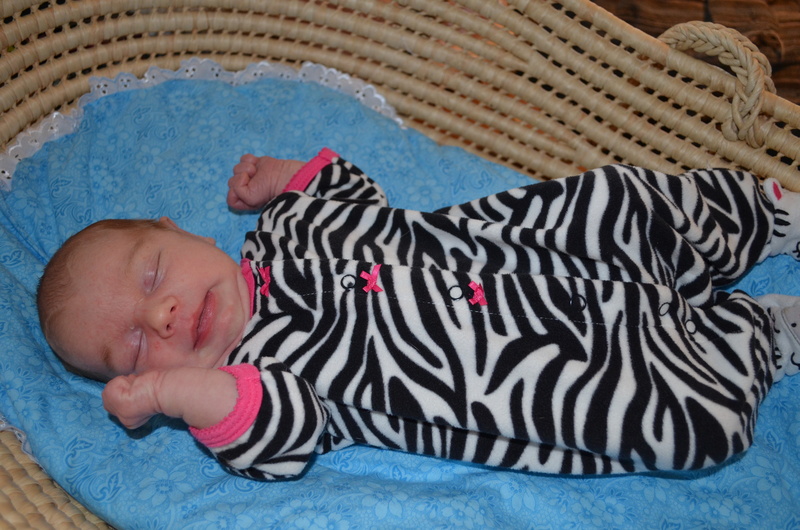 We have also given her some time to cry a little as she learned to settle herself to sleep. She is now able to independently fall asleep for naps and at bedtime. Very occasionally she still wants some snuggles in the middle of the night, but for the majority of the time she sleeps independently throughout the night. After a year of using the floor bed it seems so normal to me that I do a second glance when I see a crib. I have to remind myself that yes, some babies still sleep in cribs. If you haven’t checked it out already, Aid to Life has a great explanation, photos, and video of the floor bed. The sketches made during our training, the dreams, the room without a purpose – all turned to joy when I became pregnant. 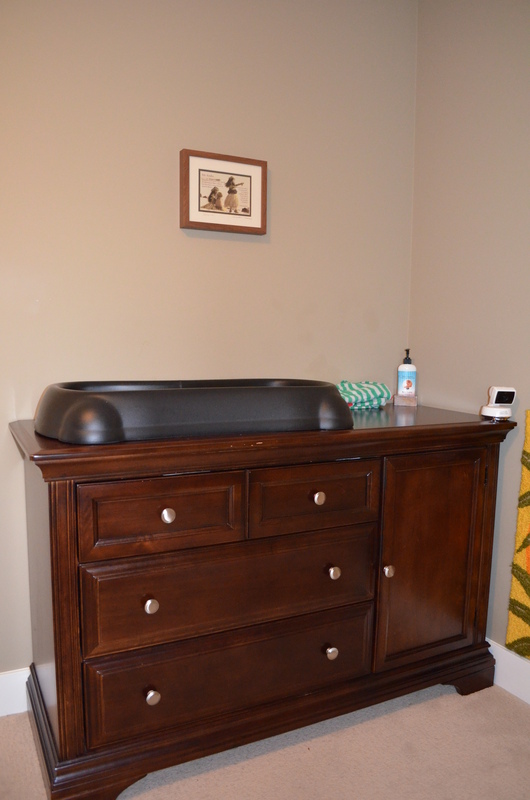 I knew what elements I wanted to have in the baby’s room well before I became pregnant so when it came time to set up the bedroom, I just had to search out where to obtain each item. My husband (ever the frugal one) made sure I didn’t spend too much. We ended up getting most of the major elements from IKEA as it was affordable and convenient for us to do one-stop shopping. No expensive crib required! One less decision to make. I waffled on if we should spring for an organic mattress, but decided to use a simple crib sized mattress from IKEA and use a wool puddle pad. As I was worried that A. would roll off (she never did), I placed a folded up blanket beside A.’s bed when she was younger. I removed it when she was confidently able to crawl off. The pillow is for me when I read her stories or lay down next to her to cuddle her. I remove the pillow from her bed when she sleeps. I also keep her book that I read to her at bedtime hidden behind the pillow. It is the only “toy” that she has beside her bed so that there are minimal distractions for sleep. Many of my friends use sleep sacks but I couldn’t figure out how they were compatible with providing the floor bed so A. could be mobile around her room. I was a little worried that she would suffocate under the blankets (yes, new mom worries), which of course never happened. I put a blanket on her and tuck her in. Often she wriggles out but is quite warm, even in the middle of the night. The blanket was lovingly made for A. by a friend. We did spend a little more on this item as I wanted something in particular. I really wanted a dresser with a door that A. could open when she is a bit older. Currently there are shelves but I hope my husband will be able to install a rod inside so that A. will be able to choose her clothes when she is a little older. With a low rod at her level I can set out a couple appropriate options for her so she can choose her clothing. I chose not to have a separate change table and a friend passed on her changing mat (a Cooshee Changer). I really like it as it is very easy to clean and it is temperature neutral (not cold, just room temperature). I like that there is no extra laundry if she goes pee or poo on the change mat. The dresser is quite large so has lots of space inside the top drawer for all the diaper supplies. With a large dresser and wanting to change her diaper by looking straight at her (meaning by standing at her feet, not at her side), this necessitated where we would place it in the room. The diaper pail (a plastic garbage bin with a washable pail liner) was beside the dresser until A started pulling up on it, opening it up, and taking out all her dirty diapers. It quickly got moved into the closet. Her dirty laundry basket is also in the closet. There are some clean-up jobs that would be beyond my daily patience level so I keep them out of her reach. My husband really wanted a rocking chair/glider for the nursery. I insisted upon a stationary chair so that eating would be about eating and comfort activities like rocking would be separate. Christie did a lovely write-up of why in “Setting up the Home: The Bedroom.” I wanted to find a chair with a higher back but couldn’t find one that I wanted within my price range. I settled for this one from IKEA that had a matching ottoman. A higher back chair would have been nice for those late nights when I slept in the chair. I really wanted an ottoman so that when she reached the stage of pulling up and cruising she would be able to do so. The ottoman provides a different opportunity for cruising than along a couch or the bar as the child needs to go around an object, so learns to move their feet in a different manner. A. has now begun doing so and I find it fascinating that her first cruising steps have been around objects, not along objects in a lateral movement. I am also really glad I had an ottoman to rest my feet as this has been a very comfortable position for me to feed A. 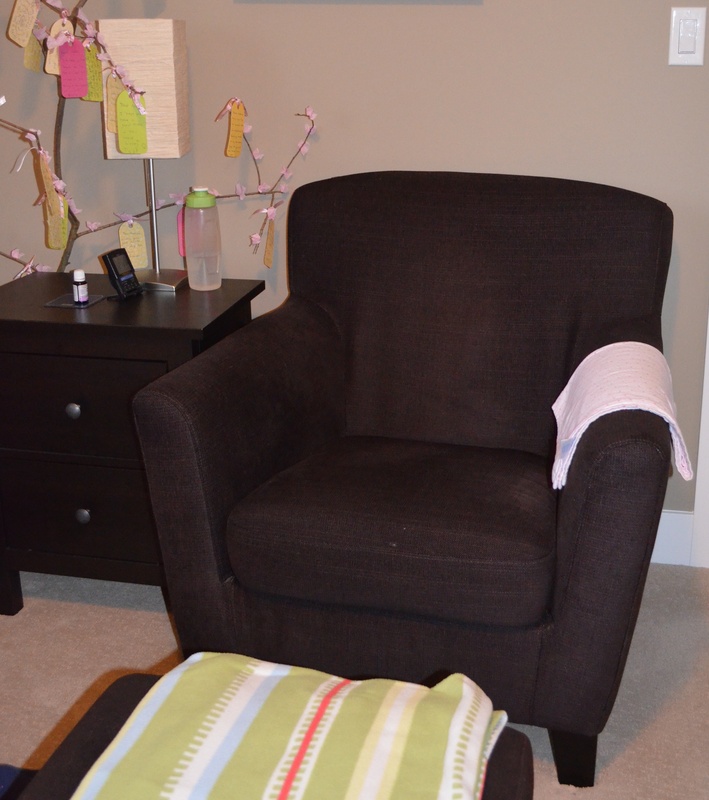 When I used a nursing pillow, the ottoman was the perfect place to lean the pillow on so that it was always handy. A side table has been essential for me. I always keep at least one water bottle ready on it, her Vitamin D drops, and some snacks inside the drawer. During the early days of breastfeeding I would pack a special middle of the night snack before I went to bed each night as I was so hungry at 2am. In the early days I kept meticulous records of her feeds so a side table was essential to have this paper and pen handy. One of the unique aspects of where I placed my nursing chair was so that it looked outside. 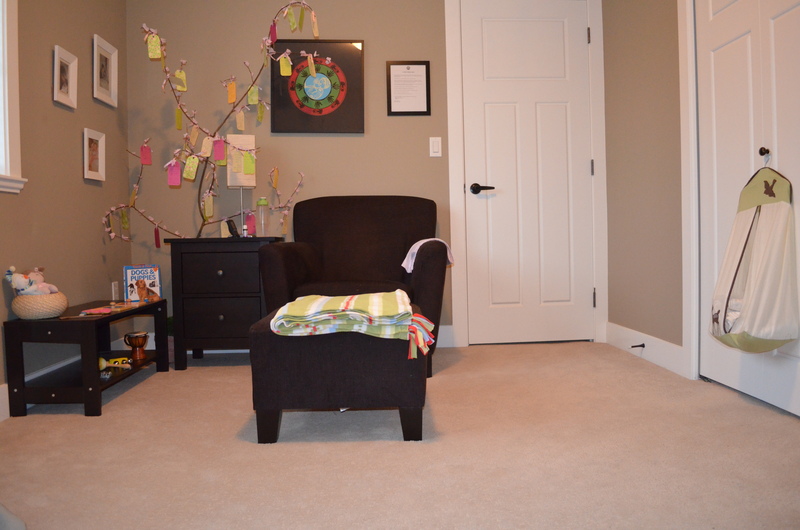 Most often I see nursing chairs stuck in a corner of a room (for good reason, they are rather dominant in a baby’s room) but I wanted mine to face the room and the outdoors. I have really enjoyed this as I connect to the outdoors and enjoy seeing and listening to children playing at the playground. I also chose to hang some pictures that were beautiful and inspiring to me. I have spent many, many hours in this chair so I am glad that I took the time to find something comfortable and created a beautiful space for me to enjoy. We have our main play area, or movement area (I’ll share in a separate post), in our living room so the bedroom only has a few items. When A. was a newborn I placed the topponcino on the carpet and as she got older I placed a small quilt on the floor. Both of these were what I used as a “movement mat” or play mat when we were out and about. 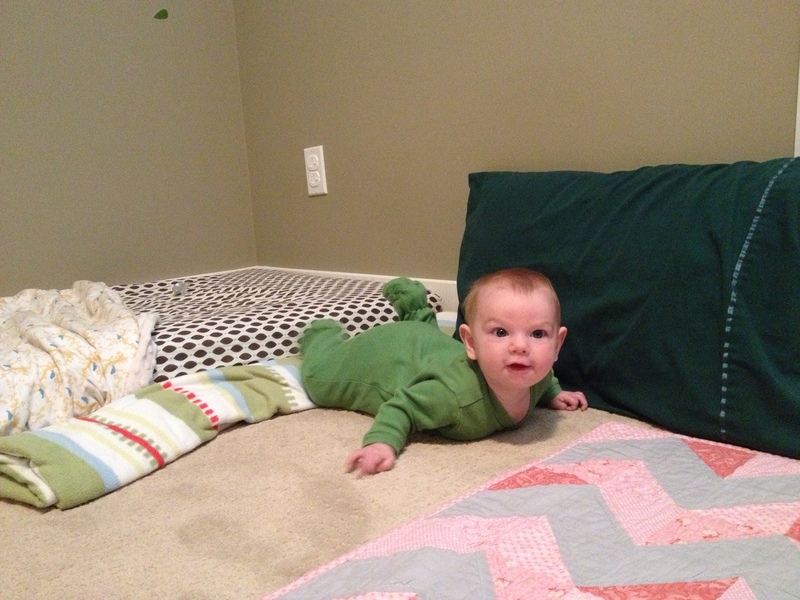 Once A. was crawling around I removed the quilt. I chose a small toy shelf for her room and have a matching one in the living room. The toy shelf is low making it easy for her to choose her own toys and low so that she can pull up on it. The toy shelf only had a few grasping materials for a very long time. This was convenient for quickly packing a few in the diaper bag when going out. Now that A. is crawling around and plays in her room a bit more I have more toys on the shelf. These are different than the toys she has in the living room. 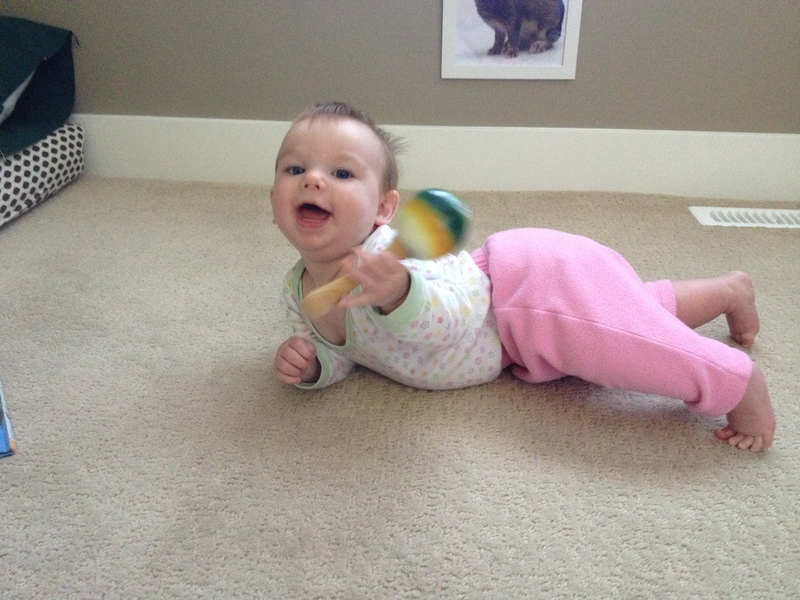 She loved to play her maraca whenever she woke up from a nap and so I just decided to put all her musical instruments in her bedroom. 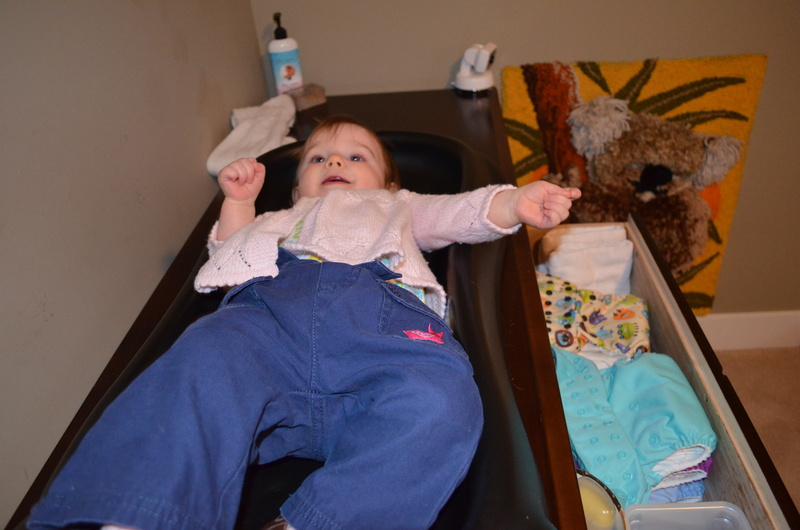 As I mentioned, the ottoman is part of her play materials. 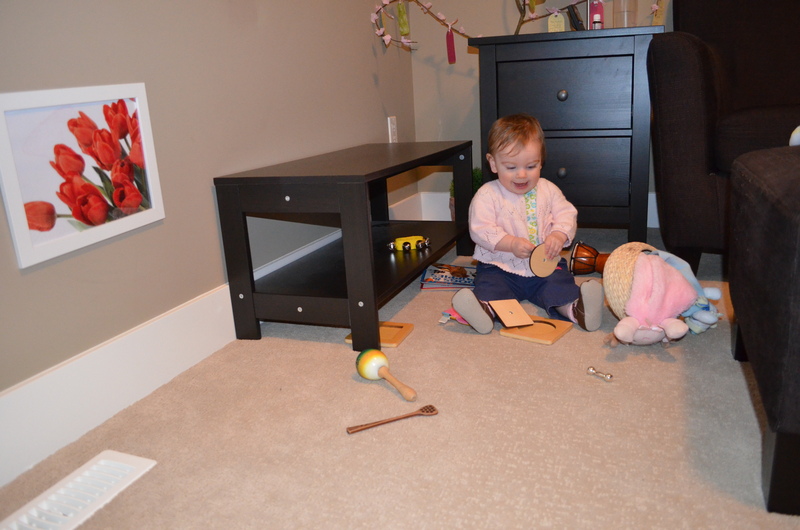 The side table has also been part of her play area as she loves to open/close the drawer. 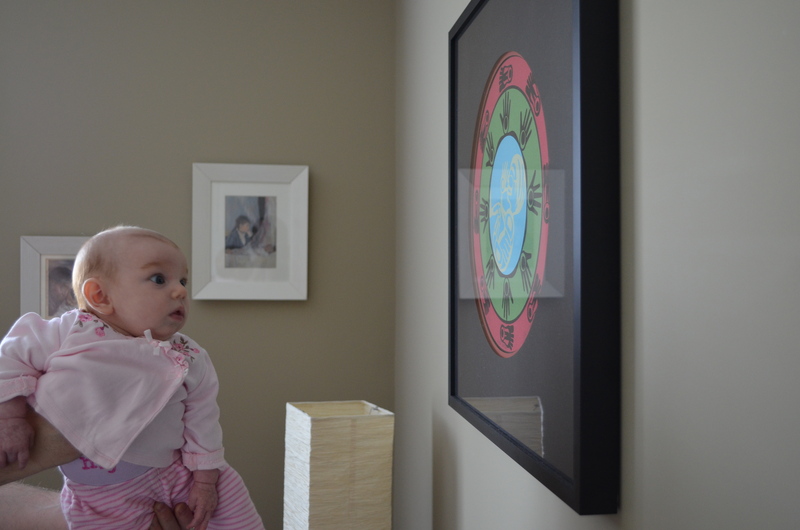 Until she was about 5 months I just didn’t get around to putting pictures on the wall at her level. I finally did so only to have her begin to crawl around and pull them off the walls within a few months. It has been a struggle to keep the pictures on the wall. I have rotated the pictures a few times, always choosing a single animal or type of flower on a white background. I just printed off some photos from the internet to keep it simple for me, although I know there are better quality available. The name sign was a gift, as was the hanging, pull-toy soldier. I don’t feel I have one of those gorgeous baby rooms filled with gorgeous little details that I handmade (I really love all those rooms). 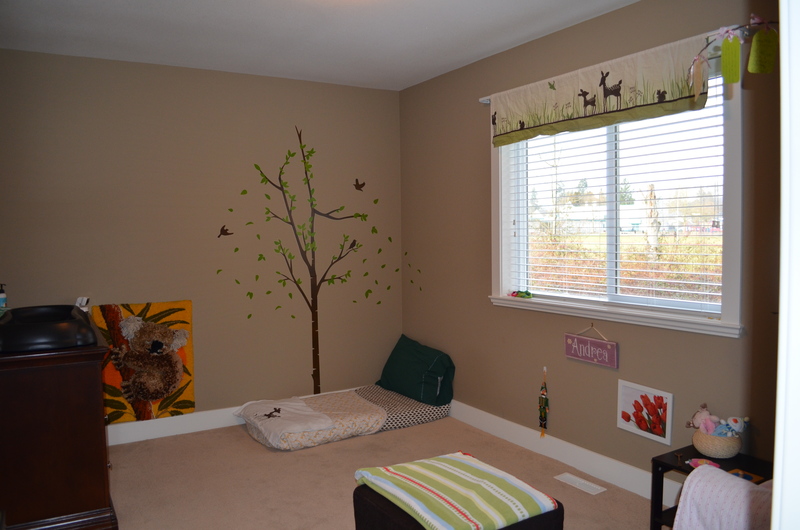 I just want to show you the essential elements to consider when setting up your baby’s room. We really kept her room simple. We didn’t paint it. We decorated with a few pictures and items we already had or were given (with the exception of a few IKEA frames for her pictures and my pictures). We purchased only the furniture we didn’t already have. I didn’t even have it all together when she arrived. 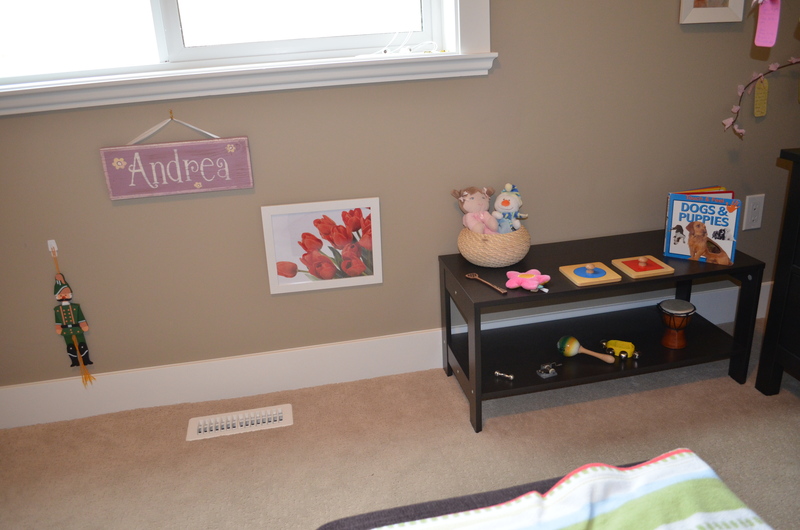 We did choose a bedroom set that was gender neutral, soft in colour, had natural elements, and was playful. We used what we had and we filled it with gifts of love from friends and family. Our Montessori trainer, ChaCha, always wanted Montessori principles to be accessible to all. The actual elements are up to you. Just ensure that the whole room is safe for exploration. Most importantly, I love it! It is a calm, beautiful, functional place that both A. and I enjoy. 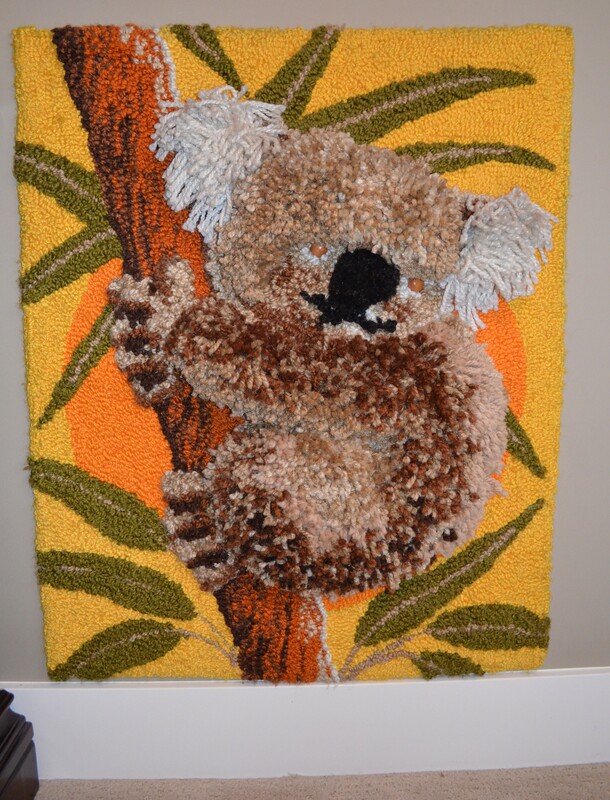 The koala was made for me as a child by my grandfather so it is really nice to have a part of his love in A.’s room as he passed away years ago. We chose to place it at her level so she can enjoy the tactile experience of the yarn and see it clearly. She loves it! It is also strategically placed for when she is older and begins to open the door on her dresser not so smoothly and the door handle will hit the soft koala and not damage the wall. With low pictures in her play area and pictures up high in the feeding area and changing area, I wanted something to tie it all together from child eye level to adult eye level. 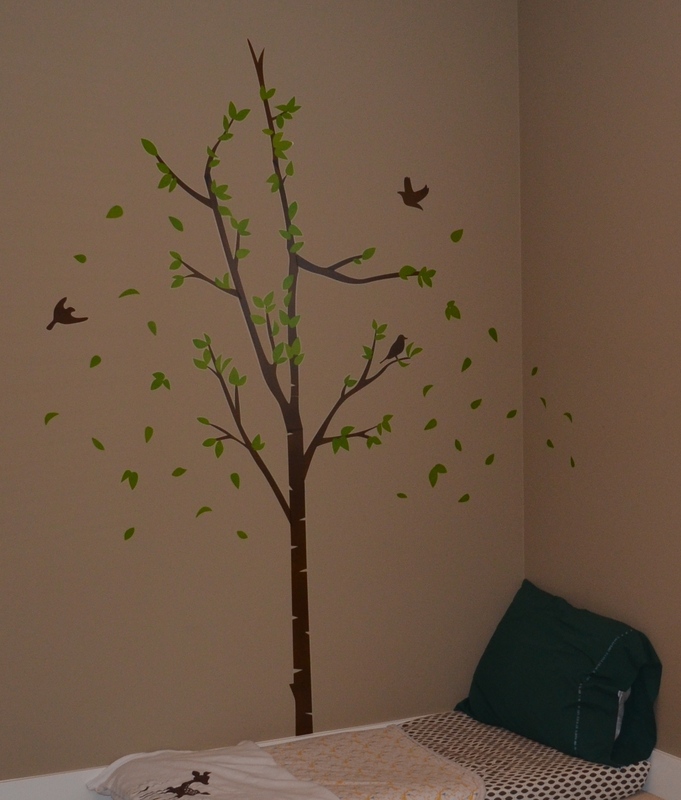 The tree wall clings were perfect! It fit in with the room theme, were affordable, and easy to put up. While I had visions of painting natural elements such as the tree, grass, etc. on her wall, my reality is far from that and I am really happy with the wall clings. When A. was a newborn my husband and I decided forgo a baby shower and have a “Welcome A. Party” with all our friends. Everyone wrote a blessing for A. on a tag and hung it on her “blessings tree” After the party I didn’t know what to do with it as I loved it too much to pack it away, so I stuck it in the corner of her room and I absolutely love it! I’ll read her some blessings before bedtime or I’ll read them to myself while I nurse her (and to her after she finishes eating). 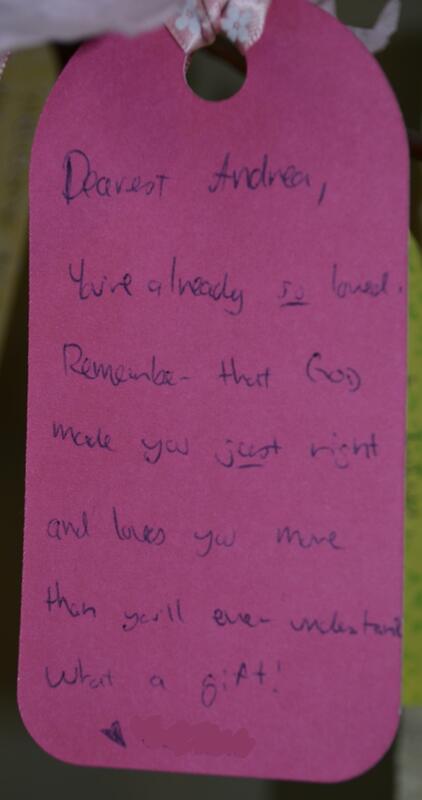 The blessings bring so much love into the room. 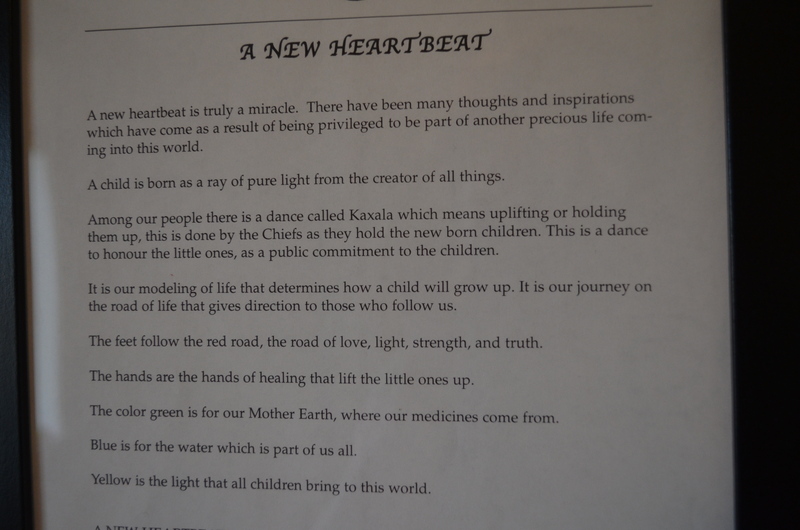 A special gift for A. was “A New Heartbeat” by Roy Henry Vickers. She would often look up at it with such intensity after she finished nursing. I love the accompanying story.